"This is a Nyx motherboard, totally nonfunctional. 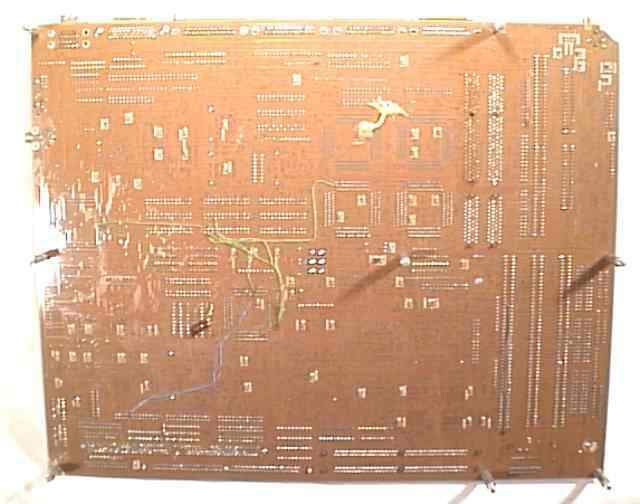 For those who don't know, this was the prototype system board for the Advanced Amiga Architecture (AAA) chipset. 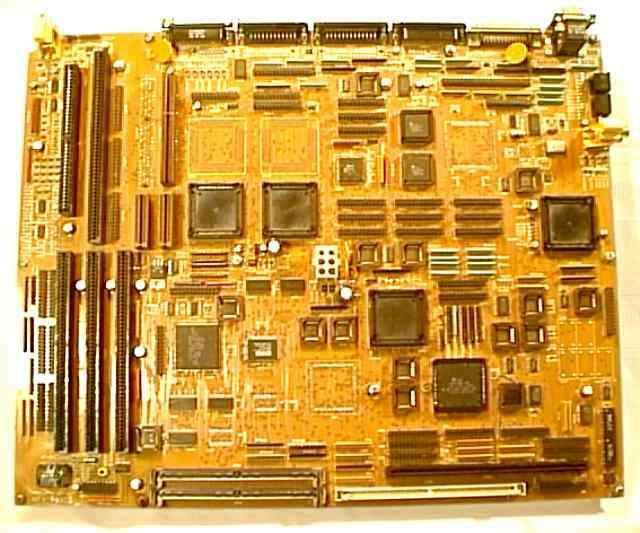 'Unlike most Amiga motherboard prototypes you're likely to come by, Nyx was never intended as a production machine. Had Commodore survived, the first AAA systems would have been based around the Acutiator architecture. 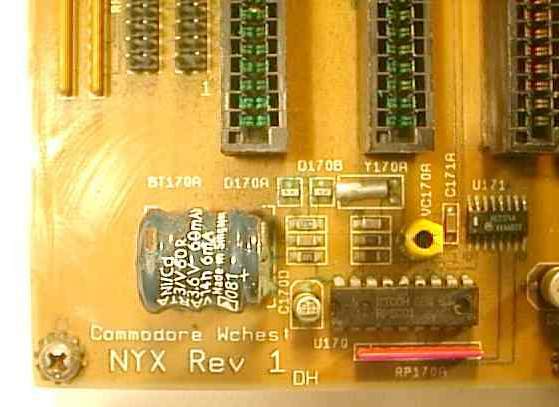 Nyx used the Amiga 3000 architecture, and lots and lots of high-speed PAL chips to work changes in the A3000 ideas. From the left, you'll see a combination Zorro III/video slot. The next slot over is a Zorro III/graphics slot. The graphics bus would allow direct digital access to the graphics bus, basically the data stream that feeds the Monica chip (Denise replacement). A graphics input device could easily live here. Next over is a plain Zorro III slot. Beyond that are two chip RAM modules (one connector is missing). The Nyx system could be supplied with either Fast-Page Mode memory or Video Memory, dual ported (FPM modules contained additional buffers to simulate dual-ported mode) on modules which were 32-bit, on the CPU port side, and either 32-bit or 64-bit, on the graphics port side. You don't see actual chips on this board. There were not many AAA chips made, and some, such as Andrea, had to be FIBed to work at all (basically, that's an expensive way to "rework" a chip). The two large chip holders next to the chip RAM slots are for Linda and Monica, the line-buffer and graphics chips. The spaces above them are for additional Linda and Monica chips, a 64-bit graphics system would have two of each. Next large socket over is the Andrea chip, which is the Agnus/Alice analog. Across a row of debug-headers (this board is full of headers that allowed easy connect to my logic analyzer) you'll find the last of the AAA chip sockets, that of the Mary chip. Mary did the Paula functions: floppy, audio, etc. The Nyx wasn't only about AAA, either, but in many ways, what we wanted to see in a next-generation Amiga in general. On the bottom half of the motherboard, you can see the SIMM modules for Fast Memory. Next to this, there was a SIMM module for ROM, which could handle either the usual Amiga masked ROM, or a Flash device. Above the ROM SIMM is an A3000-style CPU module header -- the Nyx motherboard didn't have a built-in CPU. That's also a Gary chip there, and to the right of Gary, a network of fast PALs and clock modules. AAA was ahead of its time, and in one way in particular -- it really should have had on-chip PLL (phase-locked loop) clock generators. Since it didn't, you had to supply up to four pixel clocks to the system at any given time, which could switch one to the other without slivering. The logic here does this. The reason was simple: well behaved screens. The easy reason you can't get Amiga-style screens on a PC is the lack of the copper (though many chips these days have some kind of advanced display coprocessor). The critical reason, though, is that every display mode uses a different pixel clock, and it takes a second or two for a PLL to settle at a new frequency. AAA solved this by specifying up to four clocks (in this implementation; 8 were possibly in the logical register map) that could be selected on a line-by-line basis. By selecting different clocks, and with line/pixel doublers in the line buffer, the system could not only support screens, it could cleanly promote different grap hics modes, whcn mixed, so you could actually see them on the same screen. This base shot [pic 2] shows the standoffs, a bit of rework, and a broken corner on this board. This was the first functional AAA board, and also the first to die. The death was in part purely accidental, and in part a bit of negligence. First to blame is me. Back in those days, you needed +12V for Flash memory, so I had this going to the Flash SIMM modules. Sadly, rather than protect the +12V signal with grounds on either side, or some-such, I pretty much ignored the signal neighbors. This is not the best decision, since a +12V shorted to a normal TTL-level input can destory that input. Second problem was the ROM SIMM itself. The PCB guys messed up just slightly here, so the SIMM didn't fit tightly in the connector, but could slide left or right a bit. Which allowed adjacent pins to occasionally short out. Fortunately, I noticed this early on, and did not allow a short to occur. Unfortunately, some of the chip designers didn't know about this, and one day tried to start up the board when I wasn't around. The result was a +12V short to data-line D5, killing much of the system. Well, hey, these things happen, and we had two other boards. Those boards went with some of the top chip guys on the AAA project. Far as I know, at least one of those was still functional, or at least as functional as these things got.